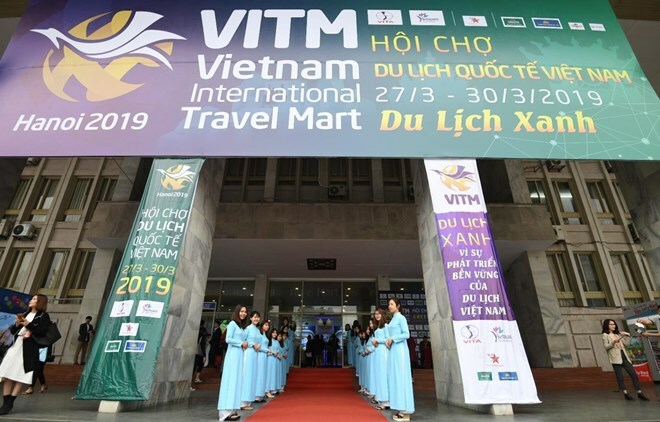 Hanoi (VNA) – Deputy Prime Minister Vu Duc Dam, head of the state steering committee for tourism, and other officials cut the ribbon to open the Vietnam International Travel Mart (VITM) 2019, in Hanoi on March 27. Speaking at the opening ceremony, Minister of Culture, Sports and Tourism Nguyen Ngoc Thien said Vietnam is striving to welcome at least 18 million foreign tourists and serve over 85 million domestic holidaymakers, earning more than 700 trillion VND (30 billion USD) in revenue this year. Apart from green, home-stay and resort tourism services, Thien suggested the tourism sector fully tap modern technology and local advantages to meet tourists’ demands, thus turning Vietnam into an attractive destination in the region. Themed “Green Tourism”, the VITM 2019 afforded domestic and foreign travel agencies a chance to discuss future business opportunities as well as introduce new destinations and products to the public. Vu The Binh, Vice Chairman of the Vietnam Tourism Association (VTA) and head of the VITM 2019 organising board, said 2019 is the seventh year the VTA has held the VITM under the direction of the Prime Minister and a project approved by the Minister of Culture, Sports and Tourism. The VITM 2019 is the largest of its kind, attracting 720 businesses and tourism promotion agencies from 27 countries and territories worldwide as well as 47 Vietnamese cities and provinces. In particular, the Democratic People’s Republic of Korea (DPRK) and Peru joined the event for the first time. The event is expected to draw up to 85,000 visitors. Notably, exhibitors will sell over 100,000 low-cost air fares and about 18,000 affordable package tours.